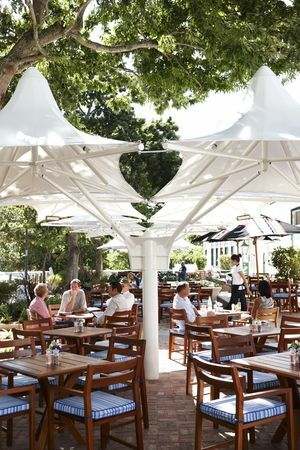 ‘The Alphen' in Constantia, Western Cape, has always been there, much like a benevolent maiden aunt at every family occasion. Now a fresh breeze has swept through the lovely old place and given it new life. A new owner, Paul Kovensky, whose innovative refurbishment allowed the spirit and ethos of the old Alphen to remain and voila, the Alphen once again stands tall and proud. And nestling in amongst all this loveliness is La Belle Café and Bakery, the brainchild and province of Simone, Paul Kovensky's wife. It was a rainy, grey day when Eugene and I first visited La Belle. 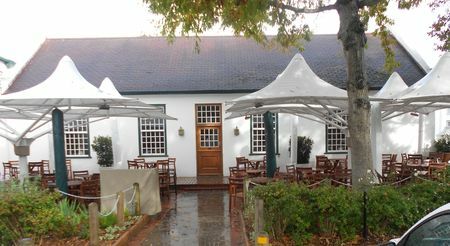 The gracious old Cape Dutch building beckoned its welcome and we happily left the inclement weather behind as we entered the warm heart of the restaurant. The welcome was smiling and friendly. I always find this so important. It sets the tone and standard for the entire experience. There is nothing I hate more than snooty, uncaring front of the house staff. Our table was cosily situated next to a wall with shelves displaying all sorts of interesting things available for purchase. We would explore those possibilities later. Drinks orders were taken and we sat back to peruse the menu and gaze about us. What a lovely room! A high pitched roof reveals wonderful old beams. We are told that the old ceiling was removed and the cathedral-like height revealed. Two huge gold mirrors adorn one end of the room and reflect all the goings on. At the other end of the room, a beautiful old open fireplace has a wood fire burning merrily in its grate. The fireplace is part of the original building which dates back to the early 1700's. The history fascinates me. La Belle, newest and youngest of the Alphen progeny, is housed in one of the oldest buildings on the estate. Originally built as a 'jonkershuis' or 'young man’s house', to accommodate the son and heir of the family and his wife, it was very much a feature of life in the Cape in those grand far-off times. The 'jonkershuis' has undergone many incarnations. In latter years it was a much frequented neighbourhood pub, 'The Boer and Brit'. But, now there is a new local, La Belle Café & Bakery. 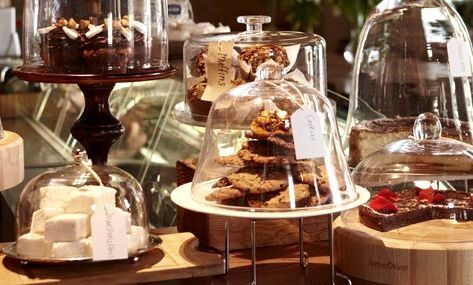 On entering the room, the first thing one sees is a very long glass counter filled to overflowing with exquisite home-baked cakes and pastries. A pastry chef, Inge Le Roux, is the creator of this amazing bounty and is also the baker of the loaves of artisanal bread that are tucked away in the shelves behind the counter. Only a very rare soul would be able to resist some or other offering. Beautiful old sash windows let in the dappled light and quirky wooden animal sculptures and pot plants in eccentric containers adorn the sills. Two large blackboards decorated in bright and happy colours hang between the windows. One proudly lists the contents of the enchanted glass counter, and the other advertises the breads, croissants, milk shakes and hot chocolate drinks that are available. All this and we hadn't yet looked at the menu! The menu is large, legible and ladylike. Printed on newsprint, sheltering in a green paper cover, the choices are presented in various sections. 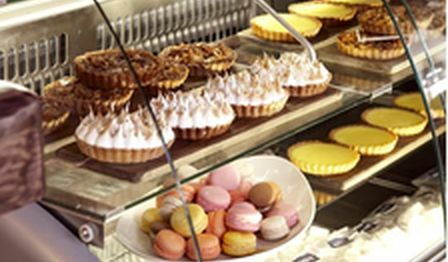 The breakfast section is full of options ranging from a 'Health' offering all the way through to 'The Five Star Breakfast with a Glass of Champagne.' En route one can enjoy 'Eggs Benedict', all sorts of omelettes, an English breakfast, a rather huge Alphen Breakfast and much much more. There are tempting offerings listed under the salad section. I have previously enjoyed the 'Smoked Salmon' salad. This was beautifully presented with avocado, baby potatoes, cress, rocket and lemon & sour cream. It was a fresh and tasty mix of flavours and textures. Try the Spicy Chicken Salad served with baby greens, bean sprouts, asparagus, cucumber, tomato and vinaigrette, a crunchy Waldorf salad or an exotic Caprese. All the flavours are enhanced by fresh herbs from their own herb garden and the salads are certainly large enough to be enjoyed as a light lunch. The Sandwich section offers a choice of artisanal breads; baguette, ciabatta, sourdough or rye. I love the sound of 'chicken and brie served with a cranberry dressing, oregano and thyme' or 'pastrami served with dijon mustard and pickles'. There is a vegetarian choice of 'marinated mozzarella, tomato, capers and basil' and for the pescatarians (described by the Merriam Webster dictionary as "one whose diet includes fish but no meat) there is a luscious combination of smoked salmon, cream cheese, avocado, rocket and onion sprouts. Carnivores can feast on 'Smokey Sirloin' served with tomato and spicy mayo or 'Proscuitto with emmental and mustard vinaigrette'. The Light Meals section is full of lovely things. Eugene and I have both enjoyed dishes from this section. Eugene tucked into the 'Braised Lamb Pie' which is served with sweet potatoes, tomato, cinnamon and cumin. It is served in a pot with a pastry lid perched at a jaunty angle. The pie crust was crisp and light and the braised lamb, juicy and unctuous. He raved about it. I discovered the delights of the Fish Cakes. If you would like to have soup and a sandwich for lunch, then try the 'Roasted Tomato Soup and Toasted Gruyere' which involves a smooth tomato soup and a toasted sandwich. Great idea! Vegetarians can choose between a 'Spring Vegetable Quiche' with a side of baby greens or a ‘Grilled Vegetable Pie' with ricotta, olives, balsamic and basil. A Charcuterie Platter that serves 2 or a Cheese Board with Country Bread and Preserves, or 'Oysters La Belle' are further choices to tempt the hungry. But now onto the Mains. The popular 'La Belle Beef Burger' with avo, tomato, red onion, rocket and porcini sauce is much ordered and enjoyed. A 'Chickpea Burger' and a 'Spring Vegetable Penne' with a gluten-free option once again caters for vegetarians and 'Sirloin Forester' or 'Fillet Steak' served with chips and Béarnaise are hearty red meat offerings. The 'Beer Battered Kingklip' with chips and cottage cheese sauce is on Eugene's wish list. He loves fish and chips. He is also eyeing the 'Meatballs and Tagliatelle' with considerable anticipation. The menu is well thought out and mindful of different food preferences. Simone has worked closely with chef, Charl Coetzee and sous chef Dennis Luke. I watched her taste various dishes that emerged from the kitchen and giving the go-ahead only to those that she considered up to her very exacting standards. There is a short and well-considered wine list which covers everything from French champagne to local bubbles, a special Constantia Valley selection and several white wines and well-chosen reds. Some wines can be ordered by the glass, even a glass of French champagne if you wish! A fulsome list of beverages offers all sorts of treats; raw juices and smoothies, milkshakes and hot chocolate variations and a whole bunch of speciality leaf teas. Interesting 'Virgin Cocktails' (without alcohol) follow and then some really posh 'Cocktails' for those that enjoy a shot or two of the harder stuff. We were drowning in choices and if that wasn't bad enough, there were two lovely specials that day. Eugene ordered one of those specials, a Chunky Vegetable Soup. The other special was Special Spicy Butter Chicken served with Ciapaty, a homemade flatbread. I dithered about as usual and eventually chose the Fish Cakes. Our waiter was a master of diplomacy and patience, knowledgeable, helpful and friendly. All the staff from the General Manager, Mariechin Pienaar who has been there since inception through to the waiting staff, displays the same service ethic of friendly helpfulness even under the most trying circumstances. Our food arrived and Eugene's face lit up. A really big soup plate brimming with steaming hot tomato- based broth filled with carrots, potatoes, beans, chunks of chorizo, herbs from their own garden and Eugene was transported. He loves the sort of peasant food that is served in regions of France when the weather is cold and the people are hungry! I tasted it and it was delicious and fragrant. My fish cakes were a joy. A delectable combination of salmon and kinglip that is made without potato and is light, fluffy and large. They were served on wilted bok choi with sweetcorn and mushrooms accompanied by a spicy Wasabi mayo, chili, ginger and coriander. All lovely, all delicious! I must add that the portions at La Belle are very generous and no-one leaves hungry. In spite of protesting stomachs, we decided to share a Summer Fruit Tart and I ordered Rooibos tea. The fruit tart was a sight to behold! Kiwi fruit, apple, pineapple and glistening red strawberries lay snugly on a bed of patisserie crème in a case of melt-in-the mouth pastry. We loved it. I particularly enjoyed the way my Rooibos tea, all leaf of course, was served. A glass teapot with a removable infuser is accompanied by a glass cup and saucer and a tea-timer that indicates when your tea is sufficiently drawn. A little ceremony at the end of the meal! We spent a while looking at the tempting wares on the shelves. Beautiful huge tins of olive oil that would look wonderful in a large kitchen, teas of every variety, spices, preserves, jars of honey, interesting bottles of Balsamic and coffee machines in bright cheeky orange. We chose a ceramic jar of olive oil as a hostess gift for a famous foodie friend and a big box of Maldon salt for ourselves. There is such charm at La Belle Café & Bakery. Tables are adorned with fresh Cape flowers and the colours of the room soothing and pleasing. The restaurant has a happy buzz and on sunny days one may choose to sit outside and enjoy the aspect of an elegant rustic terrace surrounded by beautiful trees that have been there for hundreds of years. La Belle is very family friendly and on fine days one can bring one's favourite canine on a lead to further adorn the terrace. I have a special doggie friend who is really very sophisticated and has graced several restaurants with his presence. So Rory, just a few months till summer! La Belle Café & Bakery is open 7 days a week from 07h00 - 21h00. Breakfast is served until 11.45am and no sandwiches are served after 6pm. Address: The Alphen Estate, Alphen Drive, Constantia. "Back Chat Eats Out" describes the dining experiences that Eugene and I have enjoyed and wish to share with you. These articles are written purely for pleasure. Back Chat is in no way affiliated to or remunerated by any establishment. Must head that way one day to sample their vegetarian fare! I look forward to some feedback from you after you have visited La Belle. Thanks Leslie for a wonderful read, my tastebuds are dancing and tummy is rumbling! Will definitely give it a try soon. I am sure that you will enjoy the La Belle experience.